We messaged each other for a week and then decided to do a meet and greet at a local neighborhood bar on a Sunday afternoon to watch the football games. We had an instant connection the first time we met and shared a first kiss, but I actually had another date that evening that Ed didn't know about. However, the whole time I was on my other date all I could think about was Ed. A couple of days later we went out to dinner for Ed's birthday and by the next weekend we were texting and talking to each other every day. It took POF to bring us together even though we lived a few miles from each other and went to the same Doctor. We dated for a little over three years when we mutually decided it was time to tie the knot. 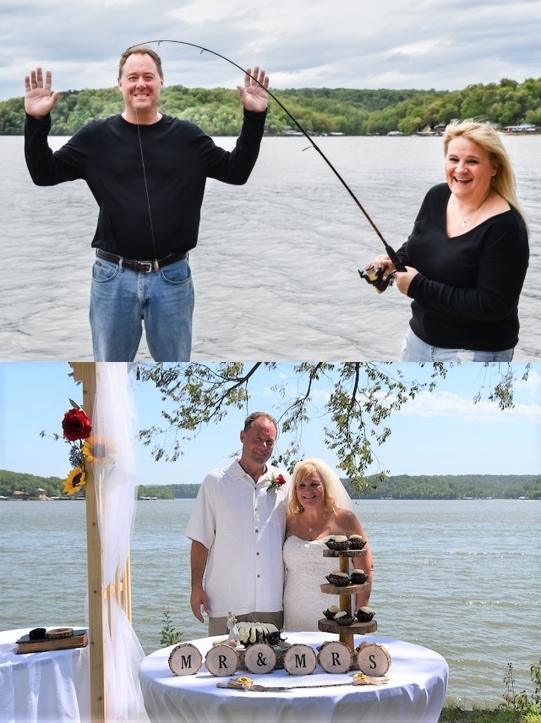 We were engaged on December 21, 2016 and got married at our lake house on July 22, 2017. Our wedding wasn't traditional as we invited a few close family and friends to take the plunge with us in the lake after the ceremony. Thanks POF for helping me hook Ed and there are now two less fish in the lake.